Palmer amaranth (Amaranthus palmeri) has garnered much attention recently in both academic discussions and popular press releases, and with good reason. 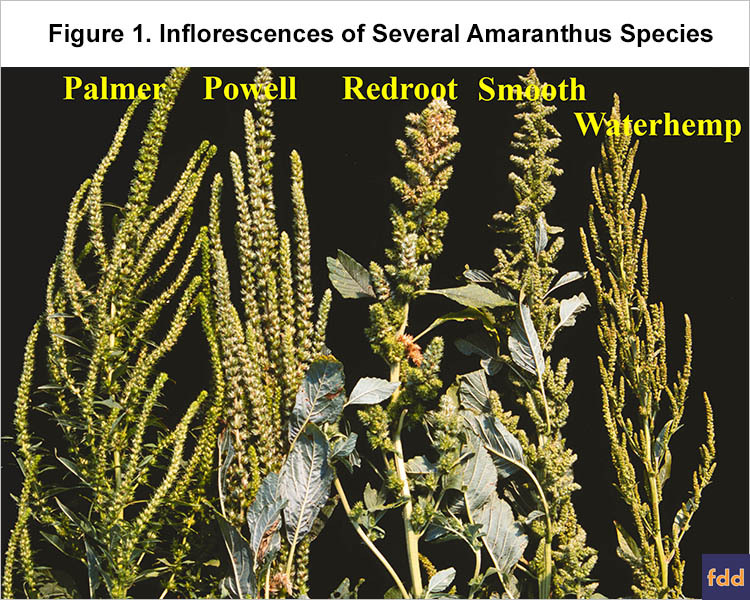 Among the weedy species of Amaranthus, Palmer amaranth has the fastest growth rate and is the most competitive with the crops common to Midwest agronomic cropping systems. Soybean yield losses approaching 80% and corn yield losses exceeding 90% have been reported in the peer-reviewed scientific literature. While most concern focuses on Palmer amaranth in agronomic cropping systems, Palmer amaranth also can become established in non-crop areas. 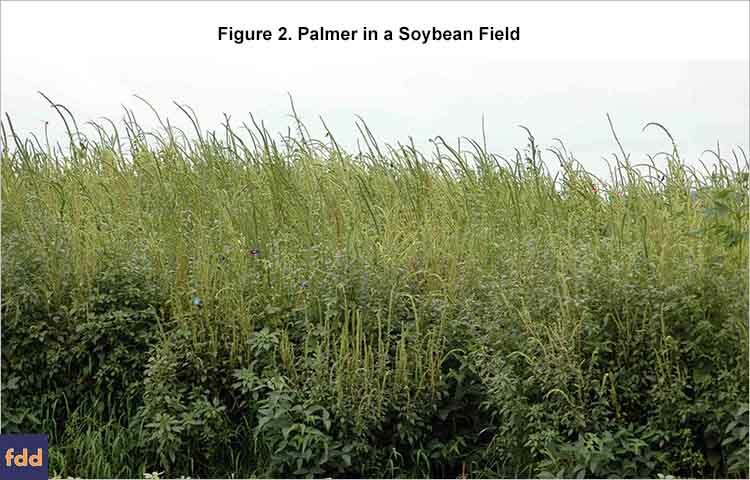 Palmer amaranth populations in non-crop environments obviously do not compete with agronomic crops, but these established plants can produce seeds that ultimately find their way into crop production fields. Palmer amaranth is a weed species that must be thoughtfully and carefully managed; simply attempting to control Palmer amaranth often leads to ineffective herbicide applications, substantial crop yield loss, and increasing weed infestations. Ignored or otherwise not effectively managed, Palmer amaranth can reduce corn and soybean yield to near zero. One obvious challenge of Palmer amaranth is being able to identify it among other Amaranthus species. Several species of Amaranthus occur in Illinois and accurate identification of these species during early vegetative stages can be difficult. However, identification of the various species becomes much more reliable when reproductive structures are present (Figure 1), and plants across the state now have reached reproductive development. 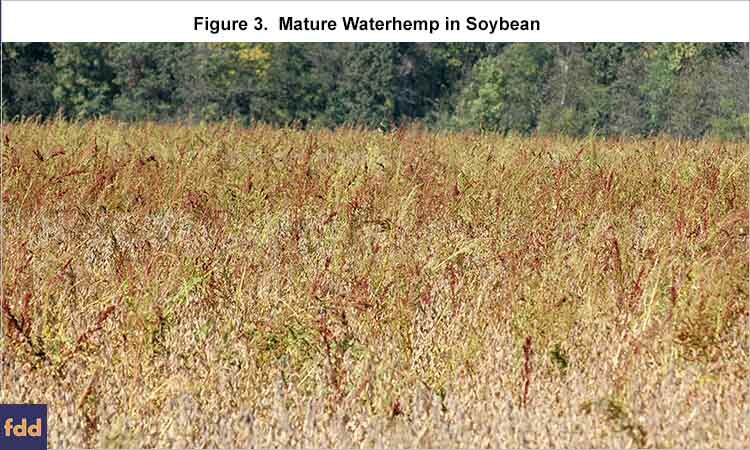 Palmer amaranth plants at the reproductive stage (Figure 2) will not be effectively controlled with herbicides, but physically roguing plants before seeds become viable will pay returns on the time investment for years into the future. The most common species of Amaranthus across much of the Midwest is waterhemp (Amaranthus tuberculatus) (Figure 3). Similar to waterhemp, Palmer amaranth plants are either male or female; male plants produce only pollen while female plants produce only seed. 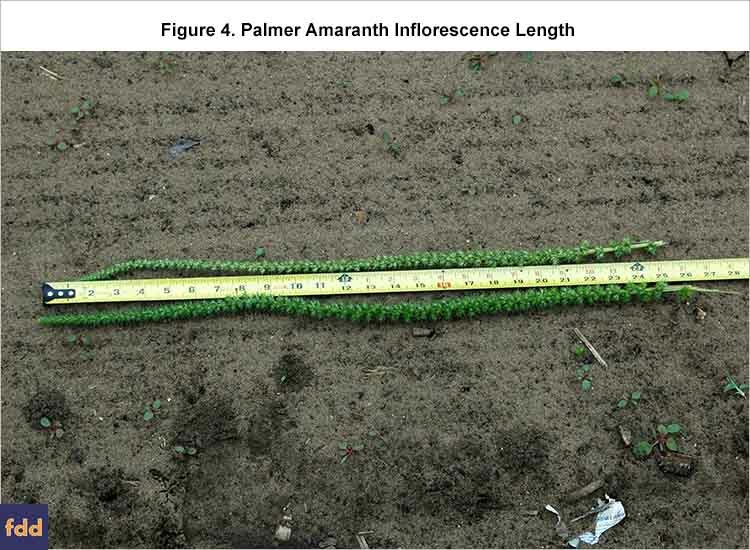 The terminal inflorescence of male and female Palmer amaranth plants is generally unbranched and very long (measured in feet) (Figure 4), whereas inflorescences of waterhemp are much shorter (measured in inches). The terminal inflorescence of female Palmer amaranth plants have flowers containing five spatulate-shaped tepals. The tepals are about twice the length of the seed, and the seed capsule (utricle) breaks into two regular sections when fractured. Modified leaves (bracts) of the female inflorescence are long and become very pointed and stiff as the plant matures (Figure 5). 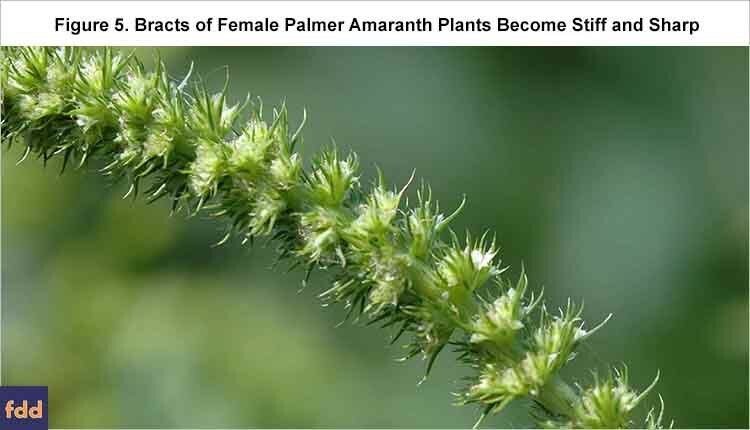 This characteristic can also aid in differentiating between female Palmer amaranth and waterhemp plants; the inflorescence of a mature female Palmer amaranth plant feels very prickly while the inflorescence of a mature female waterhemp plant is soft to the touch. If you identify Palmer amaranth plants, physically remove them before the plants reach the reproductive growth stage. Plants should be severed at or below the soil surface and carried out of the field.